It’s warming up outside and spring is in the air. This usually means we have a pressing urge to clean house, get rid of junk, and start fresh with the the budding landscape. For many people it’s a long list of scrubbing floors, vacuuming hard-to-reach places, replacing the batteries in those pesky smoke detectors, and washing the windows. Bathroom and kitchen cabinets, although important and major features in our kitchens and bathrooms, sometimes get overlooked in the Spring Cleaning process. Why? Usually because they don’t take much abuse, except maybe fingerprints on the outside. With a quick wipe of a damp cloth or a wood polish spray you can remove fingerprints and leave your cabinets looking very pretty. But what about inside? Just because they don’t always house food, water, or messy substances doesn’t mean they couldn’t use a little Spring Cleaning TLC! Our cabinets can often go unchanged and overlooked for years, but it’s smart to give them a good spring cleaning as well. Empty them out! This may seem extreme, but how are you going to get them clean or even notice any mess or damage if it’s being covered up by those ancient bowls from Aunt Mildred? Clean off your countertops, get a stepladder if you need one, and pull everything out. Assess your cabinets for damage, repairs, and cleanliness. You may be surprised to find black mold or other types of water damage if your cabinets are near a sink or washer. Those issues need to be treated immediately to protect your family and home. 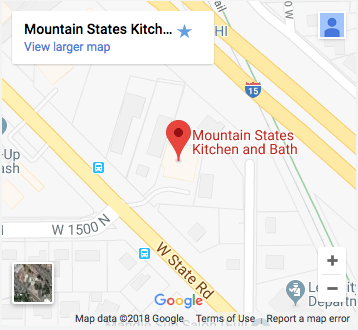 Call Mountain States Kitchen & Bath for a free consultation – they’ll tell you if the damage can be repaired or if you need to replace the cabinets. They can do both! Using a damp dish cloth and a mild dish soap wipe down all of the interior surfaces of your cabinets. Dust on the tops of cabinets and finish the exterior with a wood polish protectant spray. It is also a good idea to wipe all of the handles and pulls with a disinfecting wipe to kill the germs spread through hand contact. Add in some features! It can be as simple as a shelf liner, or as complex as a DIY Lazy Susan. Now is a great time to make your cabinets more functional for you and your family. Look online or talk to cabinet experts at Mountain States to see what your options are. Assess & Reorganize your dishes. Go through everything that was in your cabinets. If things are looking a little dusty or gross – send them through the dishwasher. If you find things that don’t belong to you – now is a great time to return them! If you find that there are dishes and items that you simply never use – donate them! Then before you add everything back into your cabinets ask yourself – What bothered me about my previous cabinet setup? How could I make this more functional? You can set up your cabinet space in a completely different way than before. Move your most-used items to the most accessible cabinets. Keep the kid-friendly stuff low and the more fragile stuff high. Your kitchen should work for YOU. At the end of Spring Cleaning you should feel like you have brand new cabinets and a brand new kitchen. And if you don’t – contact Mountain States to see what they can do about getting you some brand new cabinets!